Grover Stanley Higginbotham was born on 11 January 1915 in Amherst County, VA, the son of Grover J. and Christine E. Higginbotham. He was valedictorian at Buena Vista High School in Virginia. He attended the U.S. 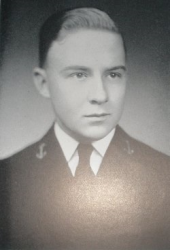 Naval Academy at Annapolis, MD, and was one of the youngest graduates of the Class of 1935. Higginbotham had a distinguished 29-year career as an officer in the U.S. Navy. His first ship was the battleship USS Arizona (BB-39) from 1935-38, where he served in the gunnery and engineering departments. In World War II, he served aboard the battleship USS Texas (BB-35) and then became Commanding Officer of the destroyer USS Albert W. Grant (DD-649), in the Pacific, where he received the Bronze Star. After the war, he attended the Army Guided Missile School in Ft. Bliss, TX and graduated from the Naval War College in Newport, RI. Later assignments included: Staff Officer to the Chief of Naval Operations in the Pentagon; Chief of Staff to Commander Cruiser Division Two, United States Sixth Fleet; Commanding Officer USS Ponchatoula (AO-148), Pearl Harbor, HI, (largest oil tanker in the Navy at that time); Commanding Officer Destroyer Squadron 25 "The Pineapple Fleet," Pearl Harbor, HI, (largest destroyer squadron in the Navy at that time); and Chief of Staff to Commander U.S. Seventh Fleet in Yokosuka, Japan. 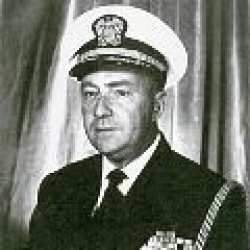 Upon retirement from the Navy as a Captain, he worked for 15 years in management for Sperry Univac at their offices in Salt Lake City, UT, Los Angeles, CA and St. Paul, MN. In Salt Lake City he earned a Master's degree in Engineering Administration from the University of Utah and was a member of Phi Kappa Phi honorary society. While in Los Angeles, he headed the development of the onboard computer system for the S-3A carrier based anti-submarine aircraft built by Lockheed. 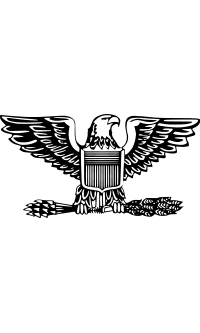 He continued to provide consulting services to Univac after his retirement. He and Vivian traveled extensively with destinations to China, Europe and an around-the-world cruise. He was a member of Sons of the American Revolution, Naples Council on World Affairs, and the U.S. Naval Academy Alumni Association. Captain Grover Stanley Higginbotham died in Naples, FL on 8 July 2007, at age 92. He is buried at Fort Snelling National Cemetery in Minneapolis, MN. He was survived by his wife, Vivian; children, Chris Slaven and Ken (Ava); grandchildren; and great grandchildren and numerous other relatives and friends around the country. He was preceded in death by his brother, Willard "Pete"; father, Grover, and mother, Christine.